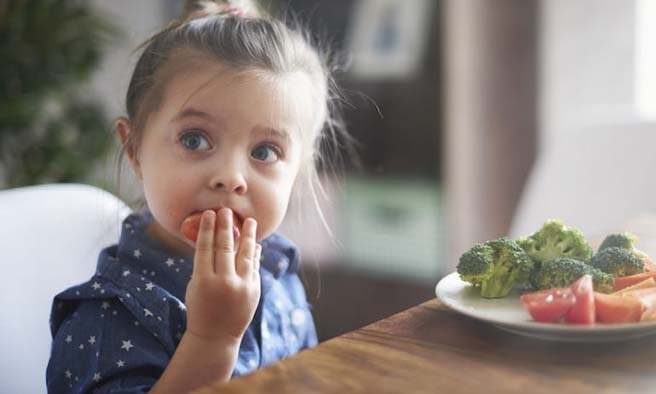 As a registered dietitian with a background in teaching children’s nutrition lessons, I’ve realized that raising a child to be a healthy eater starts long before sitting down at the dinner table. Since children are just beginning to learn about individual expression and autonomy, it can be difficult for them to blindly accept a plate of healthy food. The food’s taste, texture, or appearance may be unfamiliar or frightening to the child, or he or she might just be in a stubborn mood that day. The best line of defense against these challenges is to get your children involved in meal planning and preparation. This turns healthy eating into a fun family activity and provides a sense of autonomy that's been shown to help children learn to enjoy eating healthy foods for life. 1. Plan the meal together. Start by suggesting that you cook together as a family and asking your child what he or she would like to make. While you might not have time for this process every week, setting aside one night a week (such as Monday!) is a great way to get started. Use digital tools like the USDA's MyPlate to discuss what makes a meal healthy — it should have a good mix of vegetables, lean protein, and whole grains. Then, browse for recipes together, using online blogs or food recipes for inspiration. 2. Take it to the store. Once you’ve decided on a recipe, it's time to make a shopping list. Perhaps your child would like to explore the kitchen cabinets for what you have on hand while you write the list. As you shop together, stress the importance of sticking to the list. Are fruit gummies on the list? Chocolate cereal? No? Then they’re not going in the cart today. If your child suggests a healthy item that isn’t on the list, say that you appreciate the suggestion but you don’t have a recipe for it today. Then, use that item as your inspiration next time you're planning a menu together. When it’s time to get cooking, refer to The Kids Cook Monday’s list of cooking tasks for different age groups to see what your child can lend a hand with. It may help to designate a child-friendly area of the kitchen (often the kitchen table) where your tot can complete his or her tasks safely and without distraction. Finally, at mealtime, ensure that your family sits down to enjoy the meal together. On average, children who eat dinner with their families regularly consume healthier diets, have a lower risk of becoming obese, perform better in school, and are less likely to abuse substances. Your child may not become the world’s greatest eater the first night you cook together, but it's important to keep at it. Children may need to be exposed to new foods 10 or more times before accepting them. Stay calm if your child does reject the meal. Instead of lamenting, “But this is what YOU wanted to cook!” try to respond with something along the lines of “I’m sorry you don’t want to eat the meal we cooked together. Maybe next time.” Then leave the plate in front of your child while the rest of the family enjoys dinner. It’s likely that your child will eat at least some element of the meal. DON'T prepare another option, but if your child remains hungry several hours later you can offer the meal again or serve a healthy, convenient item like plain yogurt. By expressing him- or herself through shopping and cooking with you, your child will ultimately learn to enjoy a wide range of foods. And as a bonus, you’ll get to enjoy the additional quality time you spend together. Plus, you’ll rest easy knowing your child is gaining the skills he or she needs to be a healthy eater for life.